Technically we are in St Augustine, but right on the western edge at the banks of the St Johns River. 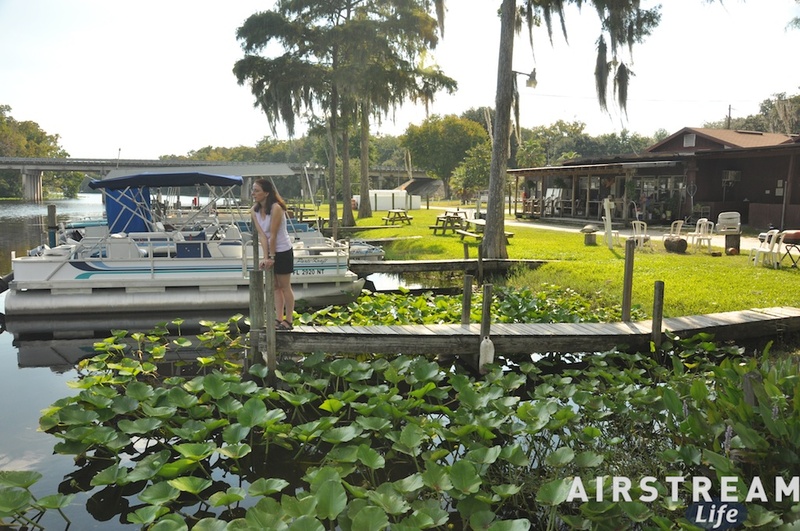 Just across the river is Green Cove Springs, a quiet small city that happens to be the official mailing address of Airstream Life magazine. I am often asked by people who call on the phone, “How do you like it in Green Cove Springs?” but we’ve only been here once before, and that was for just a few hours. We receive our mail here, and we’re incorporated here, but until this visit it has been just another stop along the road. It has been a good stop. Eleanor has been making maximum use of our relatively rare full hookup campsite, by making special meals. This means we eat well but also periodically Eleanor has to go out to find unusual ingredients, like apple brandy, which apparently must go into a dish she is preparing. Apple brandy was not available at any of the local stores (on the west side of I-95) so she made a compromise version with a reduction of apple cider and cognac. The sauces required for this dish are now done, but we won’t get to eat the actual meal until Friday, when we will be courtesy parked in Haines City. I was able to get our tow vehicle serviced, and I’m very glad I did. The dealer in Jacksonville had the car in for its “day of beauty” all of Wednesday, and replaced all four tires, aligned the wheels, flushed the transmission, replaced a blown fuse, and washed it. Although the price of the tires still has me reeling, I have to admit that the car once again drives like new. The worn tires were making a lot of noise and the roadhandling was definitely not as good as it was, plus it was pulling right a little. It may have been my imagination, but I also thought the transmission was not shifting quite as smoothly as it should, with occasional subtle balks and flares. I did a 19 mile test drive on the way back from the dealership and everything feels perfect again. 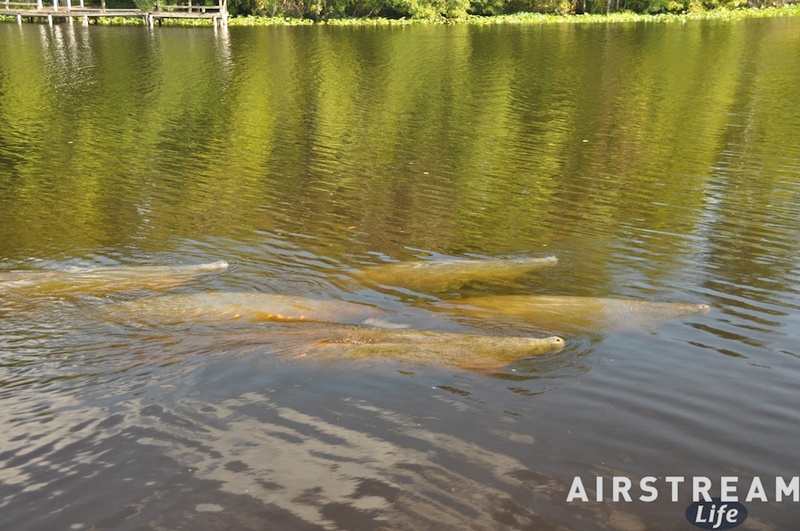 We had a surprise visit yesterday from a group of manatees, at the Trout Creek that borders the campground. Manatees need warm water, and so in the fall and winter they swim upstream from the salty ocean to fresh rivers where the water never drops below 72 degrees. A group of about eight manatees showed up with a calf, and slowly swam back and forth in Trout Creek past the docks where they made a nice spectacle for the people sitting on the back deck of the main campground building. Manatees are wonderful mammals that live very placid lives, munching on green undersea vegetation and floating through the water with no apparent goals in life. Little wonder they are often called “sea cows” — they’re about the same weight and definitely have bovine characteristics to their personalities. Their skin is like an elephant’s, and they can grow to be very large and heavy, so although they are quite benign they are also a bit startling when you encounter them while snorkeling. Their very nature of calmness and lack of fear works against manatees. 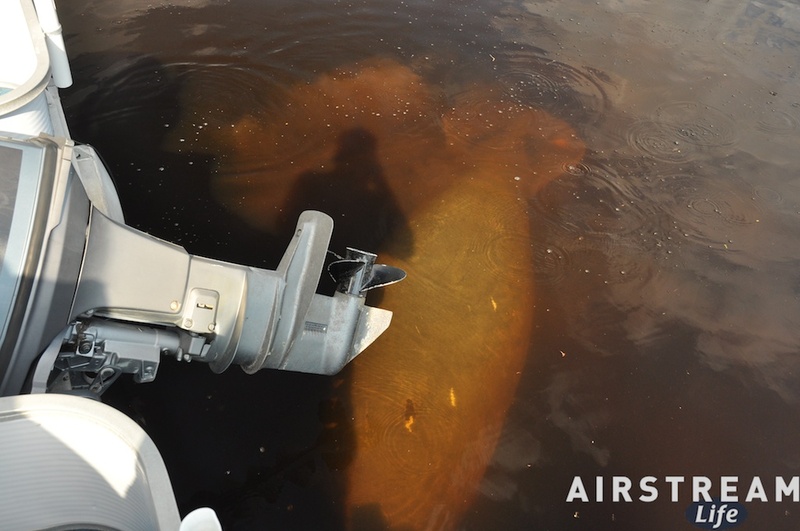 The big killer of manatees is boat propellers, and it is easy to spot a manatee with a set of slashing white scars along its body from a close encounter with a turning propeller. There are lots of regulations in place designed to prevent manatee-boat collisions but they can be difficult to avoid, especially since they are often interested in checking out what the humans are up to. We are leaving this site today but will be returning in a couple of weeks. One piece of bureaucratic business remains unfinished, and until a certain official piece of paper arrives I can’t complete it. Coming back here will be a detour from our planned route, but I don’t mind terribly since the campground has been pleasant and Green Cove Springs now feels like a symbolic kind of home. Hey Rich, did you check out the old Spanish fort in St. Augustine, or any of the old buildings? It has quite an unusual history, especially when “old” in the U.S. often means only 50 years or so. Oh, and I should have told you earlier, but manatees love cognac. We have been to Castillo de San Marcos National Monument on past visits. This time we stayed clear of downtown St Augustine and have been camped about 10 miles west of town. Nice blog.You should come down to Marco,Naples area.I bookmarked your page and will check it out more later.I wanted to show a video of manatees that I took from behind my house on Marco. It shows them up close,scars,eating,etc.Please watch and let me know what you think.